Visual Task Tips --for XP! This is one of the features from Vista I like, but on XP! Visual Task Tips is a lightweight shell enhancement utility. 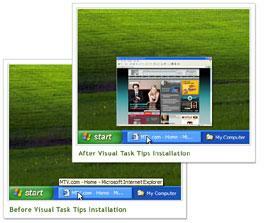 It provides thumbnail preview image for each task in the Windows Taskbar, as seen in the upcoming Microsoft Windows Vista. NOTE: Windows XP is required to run Visual Task Tips. Very nice! I'll download right away! Thanks.